For many of us, our pets are part of our family. 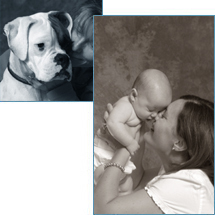 And like our family, we want to have portraits that capture the uniqueness and personality of your pet. These are the memories that you will cherish forever. Penney Adams doesn’t take the standard photographs of pets that many photographers can provide. Rather, she creates a unique set of portraits that reflect the individuality of your pet. At Adler House Photography we specialize in photojournalistic photography, which means that we encourage natural poses that are meaningful for you. We believe that the best portraits are taken when you and your animal are comfortable, not only with the photographer, but with the location itself. While many photographers can take pictures of animals, few have the genuine love of animals that Penney has, and this shows in the portraits that she creates. When taking photographs of animals, Penney doesn’t rush things; she understands how animals react in new, or different settings, and she tries to minimize distractions and will often get down and play with the animal to ensure that they have created a bond of mutual trust before attempting to take a photograph. Penney Adams’ animal portraits do not just reveal one moment in time, they tell a story. At Adler House Photography we understand that you and your pet are unique and the portraits she takes convey the personality of your pet, or the bond between you and your pet. Adler House photography is located in central Ohio, convenient for pet photography in the Columbus, Blacklick, Bexley, Upper Arlington, New Albany, Dublin, Worthington, Westerville, Ghanna, Powell, Hilliard, Grove City, Reynoldsburg, Pataskala, Newark and Groveport areas. Content of this site copyright © 1999-2005 Adler House Photography.